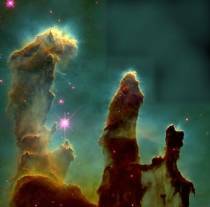 The Galactic Question Center: Afterlife? A being tells you that your current life is actually the afterlife, and it will last for as long as you wish. If you desire, you will not age or get sick. Does this statement bring you happiness or sadness? If I have no knowledge of a previous life, then calling this present state 'the afterlife' is irrelevant. But if it can last as long as I wish, then I'd live as long as I possibly could. Then wish it away - kill myself. Or better still, find a way to erase my memory in order to feel born again... as many times as I wanted. Sadness in that it means I probably won't ever get to retire, but happiness in that it means the same could be true for my friends and family. If they desired to live forever that means I'd get to know them forever. It's my connections with other people that bring so much happiness into my life. last as long as I wish, no sickness? I would stop feeling "fine" as in: freaked-out, insecure, neurotic and emotional. I would stop procrastinating and get on with doing and being all that I am. I would take more risks, speak my mind, travel and volunteer my medical and social services in places like Palestine and Iraq. happy and sad are irrelevant...I would feel liberated. Now I am asking myself...whats stopping me from doing all this right now? Anything proclaiming to be God? What constitutes, "a being" anyway? As for, "Does this statement bring you happiness or sadness?". Actually, Dr. Pickover, the statement doesn't induce either happiness or sadness in me. It only makes me wonder what the "life" that I had experienced was like. Who the being was who informed me would have great import also. After all, anyone who could give me this kind of revelation and have me believe it would be of another order of life. Sad. If this is the afterlife, I think our world resembles hell more than it does heaven. Unless it's one of those things where the world is only what I perceive to be, and the negative elements within it are just a figment of my imagination and I think I've going to talk myself into a circle so I think I'll stop now. Last Sunday a 101 year old lady I had visited for the last few months died (peacefully). We had talked a lot, when she was not too tired: both about her sadness to have survived so many people she had loved - and her never ending curiosity and interest in life. Happiness - well that's a matter of living the moment, and has not to do with living forever. But no sickness would be appreciated. :) I'd ask him..."Did you tell this to everyone else yet?" Not as much either happy or sad, I'd probably scream, "FINALLY! I've been waiting for you, what took you so long to get out here?" and continue on in my journey of wonder. I have to admit -- that would be a bit of a downer. This is not in any way what I had in mind for an afterlife. I have no idea. Happy that I would not be sick. Happy that i wouldn't age. Sad that I can still have accidents, so my afterlife can be ended. Who would want that?